Two disc set of rare Boris Karloff and Bela Lugosi films! 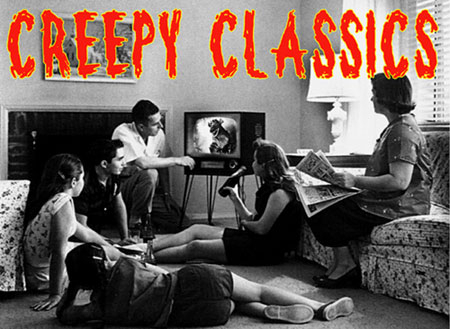 Includes: THE WALKING DEAD (1936), FRANKENSTEIN 1970 (1958), YOU'LL FIND OUT (1940 Karloff, Lugosi and Peter Lorre!) and ZOMBIES ON BROADWAY (1945). Two early Karloff films: THE UTAH KID (1930), a western in which Karloff is the nasty henchman. Plus, the rare PHANTOMS OF THE NORTH (1929) with Karloff as a half-breed trader. Bonus, the 1948 re-issue FRANKENSTEIN trailer. From the Sam Sherman archive collection. Three almost forgotten early television shows surface! MUTINY ON THE NICOLETTE starring Boris Karloff, DREAM JOB starring Vincent Price and THE LEFT FIST OF DAVID starring both Vincent Price and Peter Lorre. Adventure, drama and mystery with three titans of terror. Four classic pairings of the horror icons Boris Karloff and Bela Lugosi in Universal classics: THE BLACK CAT (1934), THE RAVEN (1935), THE INVISIBLE RAY (1937) and BLACK FRIDAY (1940). Direct from prints in the Universal film vaults. Two of these movies lead down the road to FRANKENSTEIN. Boris Karloff caught the attention of James Whale (director of FRANKENSTEIN) with CRIMINAL CODE. Great gritty crime movies: CRIMINAL CODE (1931), GUILTY GENERATION (1931) and BEHIND THE MASK (1932) with Edward Van Sloan as a mad doctor! KEEP MY GRAVE OPEN (1980) features a scary siren that lures people to a castle. BEAST OF THE YELLOW NIGHT (1971) A man is cursed to become a werewolf. Grindhouse double feature! Stars Lloyd Hughes, Sheila Manors, and Fuzzy Knight. An eccentric inventors master plans for futurist war weapons is stolen. Kelly of the secret service is called in on the case which leads to a creepy deserted mansion, hypnotism, Asian ser vents with ulterior motives and wild chills. Stars William Powell and Mary Astor. William Powell plays detective Philo Vance in a puzzling murder case.A Man is found dead in a locked room. CLICK IMAGE FOR DETAILS. Stars Leo Gorcey, Huntz Hall and Bobby Jordan. Rivalry between the kids gets complicated when the underworld is involved. The Our Gang Kids in: BEAR SHOOTERS (1930), SCHOOL'S OUT (1930) and WALDO'S LAST STAND (1940). Shirley Temple in: WAR BABIES (1932), and more. CLICK IMAGE FOR DETAILS. KIDS ON THE LOOSE (3 East Side Kids Movies): GHOSTS ON THE LOOSE (1943), KID DYNAMITE (1943), and THEY MADE ME A CRIMINAL (1939). CLICK IMAGE FOR DETAILS. It's Transylvania (and you know THAT can't be good!) and a series of murders is attributed to an age-old curse. The ghost of a young girl is seen from shadows and windows. This Italian Gothic will make the hair stand up on the back of your neck. Yeeeesh! Directed by Marion (BLACK SUNDAY) Bava. A set of crazy monsters perfect for any Saturday night! Films include: BEAST FROM HAUNTED CAVE, HORROR OF THE ZOMBIES, INDESTRUCTIBLE MAN, IT'S ALIVE (1969), KILLERS FROM SPACE, MONSTER WALKS, NOSFERATU, REVOLT OF THE ZOMBIES, SCREAMING SKULL, THE SNAKE WOMAN, WEREWOLF WOMAN (click image for more)! DVD Triple Feature: KING OF KONG ISLAND (1968), WHITE PONGO (1955), and BRIDE OF THE GORILLA (1951). CLICK IMAGE FOR DETAILS. Stars Grant Cramer and Suzanne Snyder. Tounge-in-cheek sci-fi cult favorite. Really nasty gremlin creatures from another planet land on earth. Their spaceship diguised as a circus tent. CLICK IMAGE FOR DETAILS. THE KILLER SHREWS (1959)/I BURY THE LIVING (1958) - Killer Creature Double Feature. CLICK IMAGE FOR DETAILS. Scientist enlarges shrews to the size of dogs....and they're real nasty! Not only are they the size of dogs, they look just like dogs wearing fur coats and paper fangs. Ken Curtis (Festus in the TV show Gunsmoke) produced this fifties frolic. Film Detective Restored Classics. KILLER SHREWS (1959)/THE GIANT GILA MONSTER (1959) - Restored Black and White Version, plus Colorized Versions (Double Feature). CLICK IMAGE FOR DETAILS. THE KILLER SHREWS/THE GIANT GILA MONSTER (Double Feature). CLICK IMAGE FOR DETAILS. Also known as ALIENS FROM SPACE. Peter Graves stars in an early 50's sci-fi with the quintessential bug-eyed monsters from space. Graves is brought back from the grave(s) by the aliens. Wacky. Also known as ALIENS FROM SPACE. Peter Graves stars in an early 50's sci-fi with the quintessential bug-eyed monsters from space. Graves is brought back from the grave(s) by the aliens. Wacky. The Restored Classics series from The Film Detective. The original 1933 classic with Robert Armstrong, Fay Wray and Bruce Cabot. An enterprising promoter (Armstrong) and a young beauty (Fay Wray) travel to Skull Island. Special Edition in Tin Box. CLICK IMAGE FOR DETAILS. The original 1933 classic with Robert Armstrong, Fay Wray and Bruce Cabot. An enterprising promoter (Armstrong) and a young beauty (Fay Wray) travel to Skull Island. Dinosaurs and the mighty ape -- KONG, preside there. CLICK IMAGE FOR DETAILS. Both the original classic KING KONG (1933) and its sequel SON OF KONG (1933). The adventure and the ground-breaking stop motion animation by Willis O'Brien. Stars Robert Armstrong, Fay Wray and Helen Mack. Direct from the RKO/Warner Brothers vaults of classic film. Three feature films: KING KONG (1933/Tin Box Special Edition)/SON OF KONG (1933)/MIGHTY JOE YOUNG (1949), plus boat loads of documetaries and extras. - Four Disc Collector's Box Set. CLICK IMAGE FOR DETAILS. King Kong, Toho-Godzilla style. A giant robot ape is created and real Kong and the giant robot clash. There's also a cool dinosaur thrown in for more big battles! The pairing was only natural for Toho! The two all-time greatest giant monsters meet in this big monster bashing. Stars Robert Frazer (WHITE ZOMBIE), Conway Tearle, Natalie Moorehead and Dorothy Rivier. A vamp preys on the fortunes of young wealthy men with blackmail and seduction. But, soon, she is found dead and the mystery is a foot! Movies include: KING OF KONG ISLAND (1968), THE APE (1940), WHITE GORILLA (1947), NABONGA (1944), APE MAN (1943), BRIDE OF THE GORILLA (1951), WHITE PONGO (1945), SON OF INGAGI (1940) and PERILS OF THE JUNGLE (1953). Stars Lew Ayers, Helen Mack and Alison Skipworth. A young man's sweetheart is won over by a wealthy gangster. CLICK IMAGE FOR DETAILS. Stars Tristram Coffin, Mae Clarke, Stanford Jolley and Don Haggerty. The mysterious Dr. Vulcan, an evil genius with space age gagets is killing off a community of inventors. CLICK IMAGE FOR DETAILS. Mile-a-minute action, with a thrill for every mile! Starring Allan Lane as your favorite cartoon hero Sergeant King who comes to life on the big-screen in a sensational new adventure. Based on the famous Zane Grey story about the Canadian mounted police. Stars Walter Miller, Nora Lane, Dorothy Christy, Tom Santschi and Boris Karloff. A man is imprisoned in India for a crime he didn't commit. CLICK IMAGE FOR DETAILS. Double Feature: KING OF THE ZOMBIES (1941)/DR. JEKYLL AND MR. HYDE (1920). CLICK IMAGE FOR DETAILS. Double Feature: KING OF THE ZOMBIES (1941)/NIGHT OF THE LIVING DEAD (1968). CLICK IMAGE FOR DETAILS. Four Movie DVD Set: THE DEVIL BAT (1942), DOOMED TO DIE (1940), SHOCK (1946), and THE DEVIL'S MESSENGER (1962). CLICK IMAGE FOR DETAILS. The iconic TV series with newspaper investigator Carl Kolchak (Darren McGavin) stalking the paranormal: vampires, werewolves, zombies, aliens, lizard men....as outrageous as it sounds, it's wonderful with McGavin perfect in the role. Great guest stars. Complete TV series, over 17 hours. KONG ISLAND (1968)/GALAXY INVADER (1985) - Double Feature. CLICK IMAGE FOR DETAILS. Midnite Movies: KONGA (1961)/YONGARY - MONSTER FROM THE DEEP (1967) - Double Feature. CLICK IMAGE FOR DETAILS. A man tortures a young woman thinking she's the daughter of his ex-wife's lover. He captures her in the jungle where he has exiled himself to, becoming a mystical leader for the natives. Powerful remake of Lon Chaney's WEST OF ZANZIBAR. A young man re-creates classic scenes from Universal Karloff horror movies - THE MUMMY (1932) and FRANKENSTEIN (1931). Stars Conor Timmis and Liesl Ehardt. Also, included - two H.P. Lovecraft shorts, a Karloff souvenir booklet, and more. Japanese anthology of supernatural horrors. From a snow witch to the living dead...subtle, atistic and all out Creepy. Japenese with English subtitles. 161 minutes of eerie Japenuse horror. Includes trailer.